Bacardi picks on the wrong people. YOU CAN MAKE A DIFFERENCE. Learn what you can do to stop the controversial tactics of big companies. We asked nicely but you didn’t answer, so we were forced to ask again in court. We’ve distilled some key points from those legal documents and the public record. Let’s be honest. Inconsistency was never good, but people got away with it because different audiences had no way of comparing notes. Not so anymore, when there’s an instant and everlasting record on the Internet. That’s why we sued you for trademark infringement after you apparently took our UNTAMED® trademark and ad campaign, then used it for your own rum products without permission. Lodestar’s UNTAMED® advertising campaign tells the story of The Wild Geese, a reference to the Irish Diaspora who were forced to leave Ireland yet remained defiant in the face of exile. In your UNTAMEABLE version, you claim that the Bacardi family was exiled, outlawed, and imprisoned. Is that your real heritage, or did you “borrow” that from us, too? 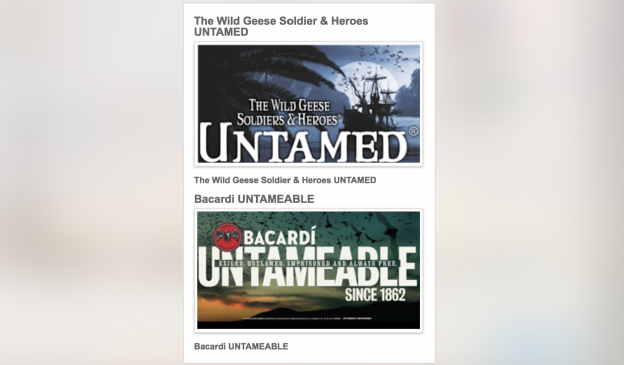 Bacardi’s own websites tell seemingly contradictory stories about its history. Is no one fact-checking, or at least cross-checking? In one version, when Bacardi was kicked out of Cuba and its assets were seized after the Cuban Revolution, “The Bacardis lost their business and their home, but … not their spirit. They simply started over somewhere else.” The picture that paints suggests the Bacardi family was near-destitute. That version appears on bacardilimited.com and is the story told in the Bacardi Unatmeable advertising campaign. Hop over to bacardi.com and there’s a different twist on the story — that Bacardi was aware troubles were brewing for its business, so it shifted assets out of Cuba beforehand. “The company exhibited keen foresight,” the website crows, “having already moved its trademarks and yeast strain out of Cuba for safekeeping. It also had an established multi-national presence and continued operations from several other countries.” In addition, according to published reports, Bacardi received approximately $350 million in subsidies from U.S. taxpayers. Feeling confused? Double-vision making you queasy, as if you’ve had a few too many swigs of rum? Then there’s the matter of the value of Bacardi’s Cuban assets and compensation. That’s always been a bit fuzzy. How much had Bacardi claimed those assets were worth prior to the revolution — which was the basis for any taxes it paid to Cuba? By comparison, how much did Bacardi claim those same assets were worth after they’d been seized and it was seeking compensation? These are just some of the questions Bacardi, for the first time, will have to answer in United States federal court. This entry was posted in Campaign News on February 14, 2018 by jamie.